Phlexglobal’s TMF Heatmaps solution provides a snapshot, from any eTMF system, of where documents may be missing across a study. This visual overview and analysis makes it easy to pinpoint areas requiring further review or remediation, enabling a much more efficient risk-based quality review approach. The TMF Heatmaps solution is extremely helpful for shining a light into legacy studies, where the quality of the TMF may be completely unknown. In addition, our customers find Phlexglobal Heatmaps to be an excellent management tool for ongoing studies, demonstrating clear oversight and understanding of the study at key milestone such as study startup, prior to a regulatory submission, and so forth. 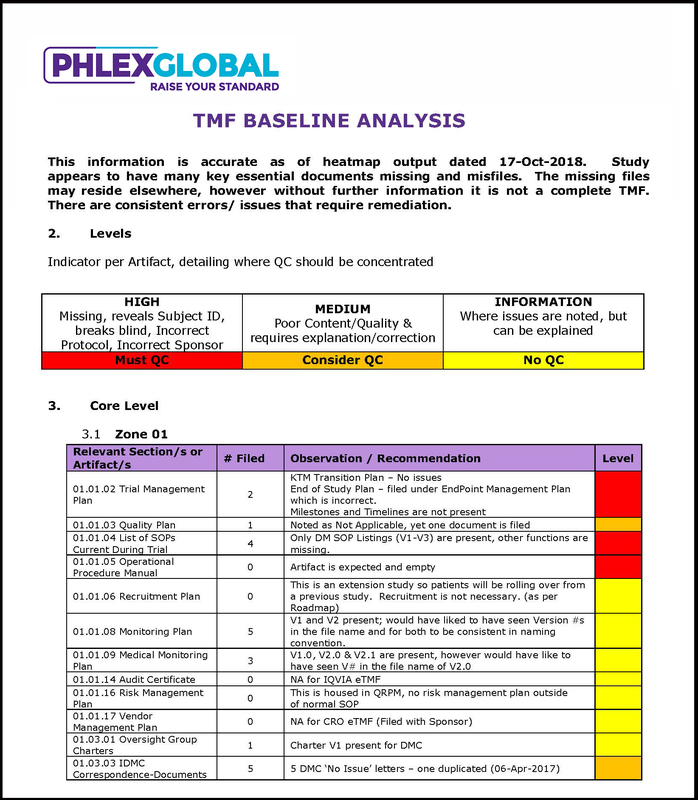 Executive Analysis: The Phlexglobal TMF Heatmaps executive summary offers a visual and textual overview of the key TMF quality and completeness findings from an inspection standpoint, identifying recurring patterns and pinpointing major and minor areas that need to be addressed. With this executive overview, you will be better equipped to prioritize your efforts and resources on the most important findings, and also gain a valuable tool to effectively communicate and justify important actions to management and other functional areas. Actionable Insights: The solution gives you a detailed and easy-to-follow roadmap regarding the key actions your organization should take to improve TMF health and inspection-readiness. Visual heatmaps derived from the information in your eTMF help pinpoint key problem areas according to different criteria such as site, trial, country, or service provider – with the ability to further drill down to uncover the source of any issues. Expert Guidance: Following the analysis of the Heatmaps findings, Phlexglobal can provide an updated recommendation of how to proceed, potentially adjusting the QC approach and offer practical suggestions based on years of experience conducting clinical trials and managing Trial Master Files.